I’ve been looking at and thinking about bikes lately. I’m in the market to buy a new one and my mind is kind of going crazy with all the possibilities. At any time of year, it’s hard not to think of bikes here in Portland, OR. They’re everywhere. Portland is the most bike friendly city in America and has the highest per capita bike commuters every year. Something else that comes to mind when I think of bikes is safety — and whether or not I will be crushed or otherwise vaporized by a two ton car on the way to my destination. 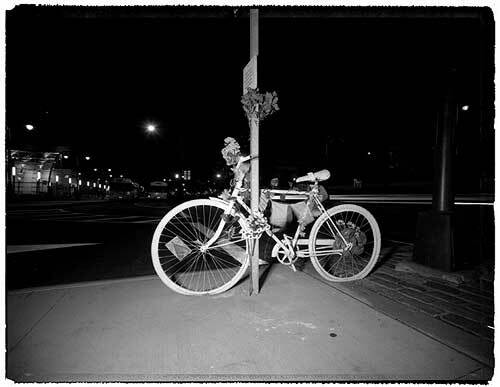 For those cyclists who do die on the way to their destination, there exists a certain kind of memorial — the ghost bike. Part memorial, part warning, ghost bikes can be found in many cities across the Unites States and the world. Painted all white, often with sprays of flowers (real or fake) and cards and various tributes adorning them, they are usually locked up to a street sign nearest the location the cyclist was hit or met their death. The first ghost bike appeared in St. Louis, MO in 2003 and was the brainchild of Patrick Van Der Tuin, a motorist who witnessed the death of a cyclist in his city and placed the first memorial bike at that site. See his website here. Websites such as ghostbikes.org and ghostcycle.org are dedicated to the dissemination of information about ghost bikes, where they can be found and bicycle/motorist safety advocacy. The New York City Street Memorial Project, a group dedicated to larger issues of pedestrian and cyclist safety on the busy streets of New York, has also taken up the cause of ghost bikes. A recent NY Times article features the organization and the story of Amelia Geocos, a 24-year-old young woman who collided with a van and who died of her head injuries. In addition, an article just yesterday describes the mystery surrounding an “unofficial” ghost bike seen in Washington Heights, a northern Manhattan neighborhood. Roadside memorials have a long and rich history. The ghost bike phenomenon is a fascinating extension of that. I think the new bike I will purchase will not be white. (The picture used in this article is attributed to the New York Times). Posted by Kim in Monuments + Memorials and tagged ghost bikes, roadside memorials. Bookmark the permalink.